The Orinda Theatre hosts a free movie night at 6:30 pm on every second Thursday of the month. Every month showcases a new interesting classic title and sometimes you can catch special guest appearances by actors and film makers. Bring some cash for popcorn and enjoy the show. Also, just a tip: there’s free parking in the garage for 3 hours if you validate the ticket at the popcorn concession stand. Plus the Orinda often (but not always) does fun trivia games before the film with tasty prizes. Movie starts at 6:30 pm. Come in early as their free movie nights fill out quickly. 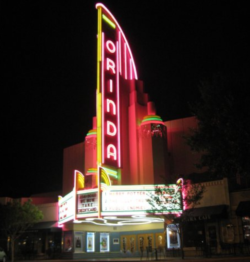 The Orinda Theatre is a 2 minute walk from the Orinda BART stop.